When you go from Büchel in the Voreifel and drive down the serpentines of the federal highway to Cochem, you are suddenly able to view all over the Mosel valley. You can see the city Cochem and of course, the Reichsburg, which thrones over the city on a distinctive rock spur only a few 100m away from the observation terrace. The Reichsburg was erected around the year 1000 by the Earl Palatine (first documented in 1051 as "Castrum Cuachoma"). Ownership was transferred to the Archbishop of Trier in the 13th century. He declared Cochem as electorate office site of the Trier Electorate and equipped it with a fortified wall. The Reichsburg had become a strong fortress and under the ruling of the Elector and archbishop Balduin of Luxemburg (1307-1354). It secured the income of taxes from Mosel ships as a heavy chain, reaching from one side to the other side of the Mosel stopped ships from passing without paying. During the Palatine heritage wars, French troops destroyed it completely in 1689. In the following 200 years, the fortress was uninhabited and 130 years ago, a manufacturer of Berlin bought the ruins and restored it according to his own ideas (1869-1877) but trying to maintain the original "style". The oldest parts (Bergfried, Witch tower and cellar structures from the 11th century) were completely integrated into the new buildings. Today, the city of Cochem owns the entire Reichsburg, exhibiting a precious art collection from the previous owner. This encompasses impressive renaissance paintings, a portrait collection with 17th and 18th century pieces, as well as exquisite furniture and interior equipment from different centuries. Cochem's particularly picturesque old city with two medieval city gates, numerous twisted narrow streets, enchanting passages and beautiful half-timbered houses, made the city a touristic centre. Hundreds of thousands of visitors come here every year, to get to know the special charm of this little Mosel city. Accordingly, it can be difficult to move through the little narrow streets in the stream of tourists from the Ender gate to the market place, or to get a free table in one of the restaurants at the Mosel promenade. The historic market place is the centre of the city, with its well, the four-storey half-timbered houses and the city hall from 1739. The Ender gate and the Balduin gate date back to the time of the archbishop and Elector Balduin of Luxemburg (1307-1354) and were built as part of the fortified wall in 1352. Integrated in this fortified wall the Reichsburg with its connecting walls. Directly at the Balduin gate, outside the old city wall, lies the "Alte Thorschenke", dated 1625, which is now a restaurant and wine bar. A climb up the old Capuchin monastery on the Capuchin hill is also recommended. This is dated to the first half of the 17th century but today it is a culture centre. You may even have time to catch the chair lift to Pinnerberg from where you have an amazing view over the city, Mosel valley with its vineyards and the Hunsrück mountain range. 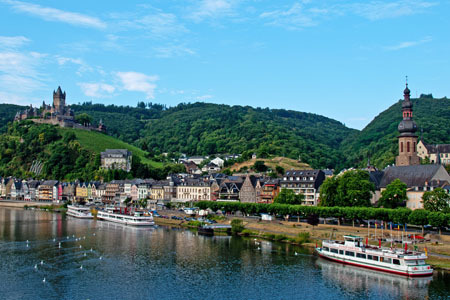 An absolute "must" however is the walk over the Mosel Bridge to Cond, to properly admire the historic scenery of Cochem. The history of Cochem is artistically engraved in the stone of the Mosel Bridge, not far from the Balduin gate. Cochem probably has a long history, judging by findings from different places pointing to prehistoric settlements. There is evidence of Celtic and later Roman settlements, with the first documentation of Cochem in 886 ("Cuachoma"). Even earlier documented is Cond in 857, with mention of the church. Closely connected to Cochem's development in medieval times is the "Winneburg" fortress from the 13th century, which controlled the accessibility to Cochem not far from the city centre. To the left of the fortress are the keep, the great hall, parts of the secondary fortress as well as ruins of certain economic buildings. After extinction of the Winnebrug family in the first half of the 17th century, the fortress was owned by Earl von Metternich who later became an important political figure. After occupation by the French troops of King Louis IVX in 1688, this fortress shared the same fate as the Reichsburg and was blown up a year later. Today it is a popular destination for hikes to the rear of Cochem.